Please keep in mind that to legally use the extracted performances, you must maintain ownership of the original diskettes, and you must not share the performances with others. This software is intended to facilitate preservation, not piracy. Equip your Windows PC with a 3.5" floppy drive (both internal and USB external drives are supported). Write disk image: controls whether a disk image file is stored in the target path along with the extracted performances. 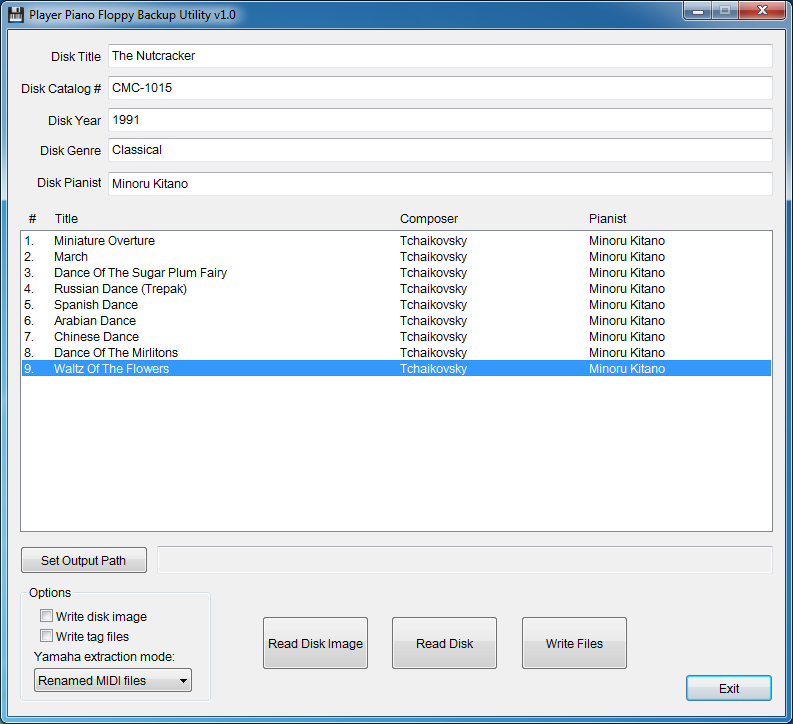 A disk image represents the contents of the floppy disk in their original format and can be loaded back into PPFBU using the Read Disk Image feature. Write tag files: controls whether a .tags.txt file is written for each performance. Tags.txt files are used in conjunction with the companion program MID2PianoCD to automatically tag MP3 files when converting diskettes to specially-encoded MP3 files for use with modern player piano systems. Yamaha extraction mode: Controls how performances are archived from Yamaha diskettes. Renamed MIDI files: The performances are converted to standard MIDI files, and the original "8.3" DOS filenames are renamed according to the title information entered in PPFBU (which is based on the abbreviated titles present within the performances themselves). Non-music files are not extracted. Renamed ESEQ files: The performances are left in native ESEQ format but renamed according to the title information entered in PPFBU (which is based on the abbreviated titles present within the performances themselves). Non-music files are not extracted. As on disk: All files on the diskette are extracted exactly as on disk, with "8.3" DOS filenames, including non-music files. Click Set Output Path to select the base folder to which you wish to archive your floppy disks. Insert a diskette to backup into the floppy drive (drive A: if multiple drives are present). Click Read Disk. The diskette will be read into memory. You can remove the diskette from the drive as soon as the floppy drive's access light turns off. The disk does not need to remain inserted for the subsequent steps. Edit the text information fields to match the actual content on the diskette, referring to the diskette label, jewel case, and booklet accompanying the diskette. If Write Tag Files is enabled, all fields are required. If it is disabled, then only the title, catalog number, and song title fields are required. The text fields and MP3 tag support Unicode. Foreign characters may be cut and pasted into the fields from Windows' Character Map utility (Start->Programs->Accessories->System Tools->Character Map). Click Write Files to store the extracted performances to an automatically-created subfolder within the target folder. Repeat steps 5-8 to backup additional diskettes. Hint: Filling out the optional Disk Pianist field will automatically propagate the pianist fields of the individual songs. This is useful for diskettes in which all tracks were performed by the same artist. Diskettes archived with PPFBU may be batch converted to MP3 files suitable for playback on newer player piano systems using the companion program MID2PianoCD. Be sure that Write Tag Files is enabled while archiving your floppies, and be sure to enter the text information as completely and accurately as possible. Click Add Folder and point MID2PianoCD at the base folder to which you've archived your diskettes. All of the diskettes will be imported into MID2PianoCD's Files to convert window automatically. Under Encoded output path, select Use output path specified below and point MID2PianoCD at a new empty folder where you want to store the MP3 files. Under Output format, select the type of player piano system you have and choose MP3 as the audio file type. Leave Prepend format identifier unchecked. Click OK to close the Advanced Features window. Copy the encoded, tagged MP3 files to your MP3 player just like any other MP3 files, connect the MP3 player to your piano's audio inputs, and play the files. Ensure the MP3 player's volume is turned up reasonably high (at least 80-90%) and ensure that any special features (equalization, bass boost, etc.) are disabled. If the files fail to play, double-check that the left and right stereo plugs are not swapped and that the player piano controller is in the proper mode to accept external input. Diskettes archived with PPFBU may be batch converted to CDs suitable for playback on newer player piano systems using the companion program MID2PianoCD. To do this, follow the steps in the preceding section, but set the audio file type to WAV instead of MP3. After the conversion process has completed, locate the WAV files MID2PianoCD generated in the target folders, and use any CD-burning package (EZ CD Creator, Nero, etc.) to burn an audio CD-R or CD-RW of each album. Use Disc-At-Once mode to burn the CD, if available, and be sure to close the session. Do not create a data CD (i.e. a CD with files and directories on it) or the disc will not play on your piano. PPFBU is available for free. But if you find it useful, please consider making a $20 contribution to offset my costs and encourage further development. This program contains no advertisements, spyware, crippled features, nagging, or other such junk, so I rely strictly upon user contributions to cover my time and expenses in developing this tool. Click the button to contribute via PayPal. You don't have to be a PayPal member to contribute, and you can use your credit card. Please contact me by email for the payment address (my email address is at the bottom of this page). This software is designed for Windows 10/8/7/Vista/XP. It might run under some Windows emulation environments, such as WINE, though this has not been tested. This software and web site are not affiliated with Yamaha, PianoDisc, or other companies mentioned. All trademarks are the property of their respective owners and are mentioned strictly for informational purposes. Users of this software are expected to respect the rights of content creators and handle backed-up content in a manner compliant with applicable laws.